Out of town friends visited us this past week. With them, we visited Butchart Gardens, just 15 minutes away. The gardens are self-guided, but we had a personal guide - Sandy - our son-in-law's mother. Owen's father was in charge of maintaining the equipment at the gardens for many years and the family lived on the property. Sandy knows all sorts of interesting tidbits and shared them with us. Thank you, Sandy. Lots of summer colour still brightened the gardens, but signs of fall are everywhere. Golden leaves shimmered in the afternoon sunshine. Unfortunately, my camera battery died about 1/3 of the way through the gardens. So, no dahlia photos (they were stunning), no late summer roses (beautiful), no fountains. Sigh. I need to be better at checking my battery life. Here at home I've begun the garden cleanup. The green bean vines are in the compost bin, as are the sweet peas. I didn't think I'd have sweet peas this year. Our spring was so cold and wet and the seeds didn't germinate. Or so I thought. One day I noticed a plant starting and I nurtured it as best I could, protecting it from slugs. Usually sweet peas bloom early - these didn't bloom until late August. I picked the last bouquet and set it on my kitchen windowsill. The fragrance wafts as I do the dishes. Delightful! Joining in with Mary at the Little Red House for Mosaic Monday. I remember visiting Butchart Gardens as a child and thought it beautiful waaayyyy back then. On my bucket list to revisit. The sweet peas are a lovely shade of violet, I hope they smell as nice. Take care and blessings. Wasn't it a beautiful day? I've begun the clean-up, albeit slowly. Your Sweet Peas are lovely. That Sweet Pea was a lovely surprise for you Lorrie and it is such a beautiful shade of soft violet blue. I've read a lot about your world famous Butchart Gardens - you are so lucky to live close by and see the changing seasonal plantings. Maybe you'll show us more photos in another post - one day! My sweet peas were late too this year but have certainly made up for their tardiness with masses of muylticoloured blooms and I am still picking although they won't last much longer I know. Love the colour of yurs. Your images are lovely. 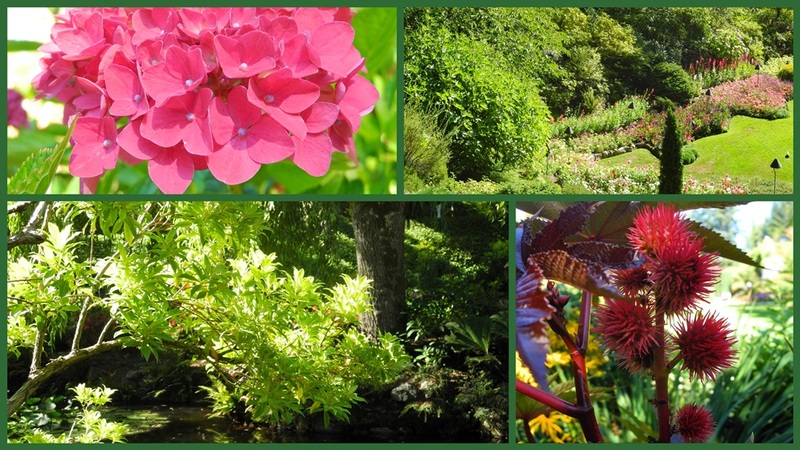 I do so love Butchart Gardens. It has been way too long since I have visited Victoria. We are way overdue. Your sweet peas are lovely. The Sweet Pea is lovely. The Gardens looks beautiful, glad you had a nice visit. I have started carrying an extra battery with me, just in case. Lovely images, thanks for sharing. Have a happy week ahead! Lovely photos all... I hear so much about these gardens. They've got to be incredible and how nice to have a tour guide with the inside news. My parents visited Butchart Gardens in the 80s and brought back a calendar. I was mesmerized by the beautiful pictures. How nice that you were able to go there and have such a knowledgeable tour guide. What a nice and pretty surprise your sweet pea is! I miss sweet peas -- we always seem to be away when it's the best time for planting them -- I'm inhaling from here . . .
And to add to Vee's comment, I invested in a second battery (and it wasn't too dear) for my travel camera, so I always have a charged one in my camera pouch with me. It's saved me a number of times already. I am always forgetting my SD card. Always. And I have missed so many pictures! I need to get a spare and keep it in my camera pouch! your flowers still look beautiful and your pictures are great. I used to get an empty battery often enough but now I have two so I won't miss the good places. Have a nice week. Love these shots. It feels it's a bit summer I see beautiful flowers everywhere. Thanks for the visit. Gorgeous, Lorrie! I love that little snippet of green lawn. lovely garden views. So strange to think of you going into Autumn while we are welcoming the spring. Sweet-peas - love them - but I haven't grown them for years - I need somewhere to put up a trellis in the sun - maybe next year. Thank you for stopping by my blog today to say hi - have a wonderful week.